We will arrive in Dublin a little blurry eyed at approximately 5:30 am their time. Take your time. Wake up to some coffee or grab some breakfast. If you are a chocolate person, look for Butler's Chocolate. Wonderful chocolate drinks and chocolate bars. Get through customs. Get your luggage. Get oriented. Then we meet our tour coach at 7am. Our driver/guide will take us to some of the points of interest in and around Dublin. Around 10:00 we will visit the Guinness Storehouse and Gravity Bar. You will have a chance to “pour a perfect pint”. And so we start our crawl. After the tour you will have time to shop and grab a bite of lunch on your own along Nassau Street. Not in the mood for lunch? Head up to the National Museum of Ireland and see the mysterious Bog Bodies. Dublin maps will be available. We will check into our hotel that evening, snuggled on the edge of Temple Bar. It is within walking distance of the city nightlife yet quiet enough for a good night's sleep. That evening we will have a group Welcome/Fàilte Dinner at the hotel. We will start the day with a good Irish breakfast at the hotel. At 8:00 we will board the coach and take a scenic drive to tour Leap Castle in Roscrea. A DarlaTours exclusive and one of the most haunted places in Europe as featured on many tv shows and YouTube channels. We will stop in Roscrea for lunch on your own. There is a variety of restaurants and shops. We will return back to Dublin for you to have supper on your own. Maybe in the Temple Bar area. At 7 we will begin our investigation of one of the brothel rooms of Darkey Kelley's. Space is limited however we will have the room all night. We will end our stay in Dublin with another full Irish breakfast at the hotel. We will board the coach for Moy in County Tyrone at 9 am. This is a cozy little town rich in history and antiques. There are cafes, coffee shops and farmers' markets to grab a quick bite. After lunch and exploring, we will meet up with Maura Brooks, Psychic Medium, and Reiki Master. She will lead us on an adventure you won't soon forget exploring some of Ireland's most ancient sites and forgotten lore. Another DarlaTours exclusive. After an afternoon with Maura, we will continue north to Belfast. We will check into our hotel before heading to prison. Crumlin Road Gaol, that is. Our tour there begins at 9pm. Paranormal After hours. We will visit holding cells and death chambers. After a full breakfast at the hotel, we will head out to the northern county for the day starting at 8 am. First we will travel to Bushmills Distillery. Also during this day, we will visit the beautiful Giants Causeway and discover the myth of the giant, Finn McCool. We will also explore the ruins of Dunluce Castle. Several ghosts are said to reside among the cliffs and rubble. You may recognize this from Game of Thrones. Lunch will be on your own either at the guest center at Giant's Causeway or the cafe at our next stop, Belfast's Titanic Museum. The museum is located at the shipyard were the ill-fated steamer set sail. We will then return back to Belfast where you will have the evening to explore for yourself. Dinner is on your own. Nearby is the notable Crown Bar, the haunted Belfast Opera House and the Europa Hotel, the most bombed hotel still standing in Europe. This is the last full Irish breakfast of the trip because we are leaving for Scotland. We will pack up and leave for ferry to Scotland at 8am. Our Irish coach and driver will be continuing with us. Our first stop in Scotland will be Ayr the home of Robert Burns. You can also grab a bite to eat for lunch on your own. Next we will travel to Stirling Castle and tour the castle and grounds including the dungeon and the graveyard. 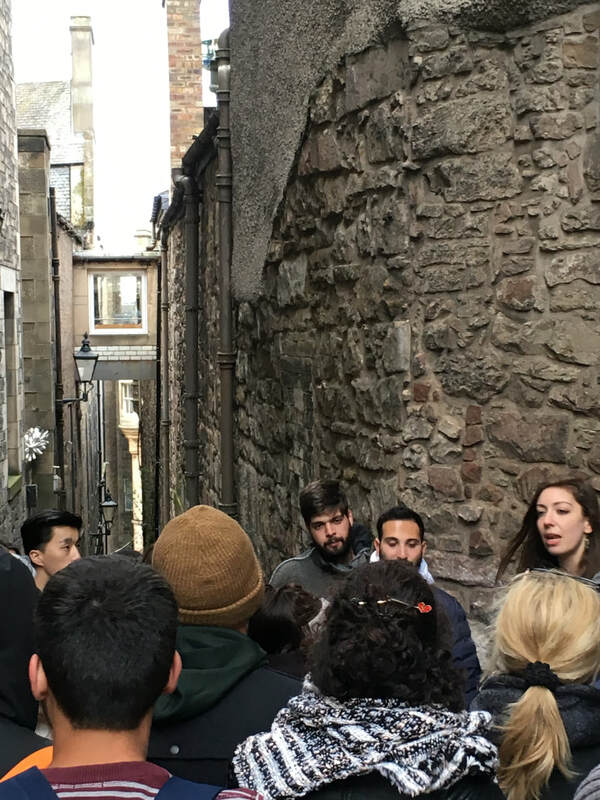 In the afternoon we will check into our hotel in Edinburgh seated along the Royal Mile, steps away from Mary King's Close. We will have a group dinner that evening at the hotel or a nearby pub. Breakfast at the hotel in Edinburgh. At 8 am we take a walking tour of Edinburgh and visit the Edinburgh Castle. Lunch on your own with some shopping/exploring time. Dinner is on your own as well. Enjoy getting to know this beautiful city. In the evening, we will have a walking tour of Edinburgh Ghostly Haunts. We say goodbye to Edinburgh with a full breakfast at hotel. We leave Edinburgh and head to St. Andrews at 8 am. While at St. Andrews, there will be some time to explore and have lunch on your own. St. Andrews is home to more than just golf. The beautiful seaside ruins and graveyard will have you enchanted. Our next official stop will be Inverness. After a bus tour around the town, we will check into our hotel. Inverness is known as the Gateway to the Highlands and is full of eeriness and Scottish mist as it sits on the banks of the river Ness. After a hardy breakfast at the hotel, we will spend a good share of the day exploring and touring Culloden Battlefield, one of the bloodiest sites in all of Scottish history. Be prepared for a chilling experience. While out we will stop on the outskirts of Inverness at an authentic and active Clootie Well. We will later return back to Inverness for dinner on your own. We will have a full breakfast at the hotel before leaving Inverness and heading to Loch Ness. At Loch Ness we will have a boat ride tour and look for Nessie. The vessel is has sonar and a bar onboard. Our cruise will also include time at Urquhart Castle. That afternoon we will return to Edinburgh near the Airport. We will gather together one last time for a farewell dinner at the hotel. Plan on making it an early night. Our flight leaves at 8am. We depart Edinburgh early to catch our flight and after a brief stop in Dublin, we return to the US. Join us for this exciting adventure for $300 deposit. Monthly payment plans available. 0% interest. ​Group air available staring at $850 from Boston International.